This image was created at the luxury hotel, The Hyatt Regency Long Island in Hauppauge, New York. Elegantly decorated and appointed the Hyatt rivals many of New York City’s most elegant venues including The Plaza, The Pierre and The Waldorf Astoria. In the course of my career I have had the experience of creating extraordinary wedding photographs at many of the finest hotels anywhere. The opportunities for amazing wedding pictures abound with stunning architecture and designer appointments. Often the bride and groom are staying as guests in the hotel itself using separate rooms to prepare for the big day ahead. After the reveal, the first look that the couple enjoys of each other, we normally create some fantastic wedding pictures taking advantage of the exquisite surroundings. 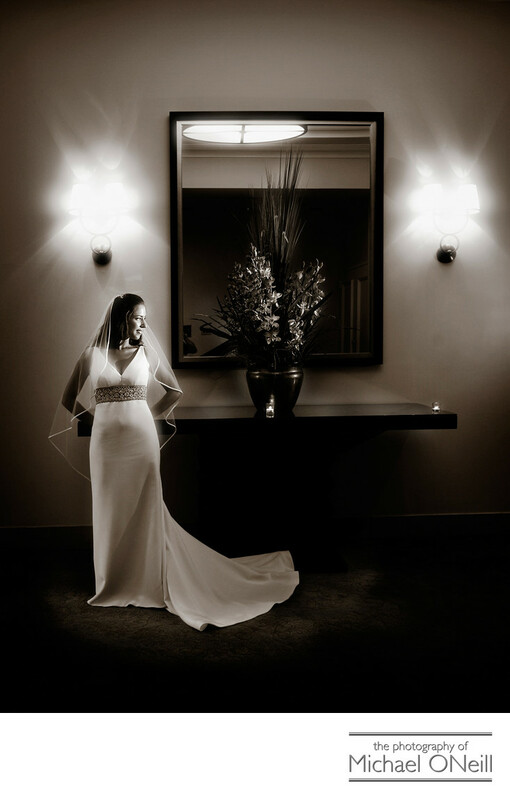 There is nothing quite like a NYC hotel wedding for unreserved elegance. Large ballrooms exquisitely decorated with extravagant floral centerpiece designs and custom linens and chair covers makes every event unique and special.